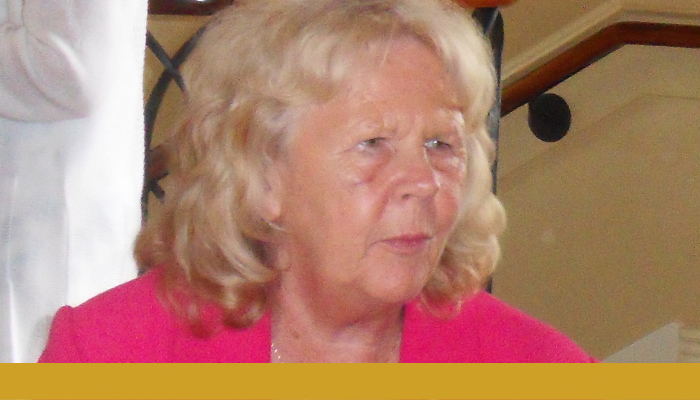 I’m Carole Holmes MBE and about 31 years ago I lost a considerable amount of sight due to retinitis pigmentosa (RP). My sight deteriorated, but I managed to work full time until I was 40. I have been involved with RNIB in a range of roles; fundraiser, campaigner, committee member and volunteer for the Talk and Support and tele-befriending service. For several years until 2011, I was the North West regional representative for Visionary. I was also a member of RNIB’s Executive Council (later known as the Assembly) for nine years until 2009, when I was awarded an MBE for my 20 years of voluntary work supporting people with sight loss in the North West. I really don’t know what I would have done without RNIB. It made my life much fuller and richer. I decided to leave a legacy to RNIB in my Will because without it, people who have a sight problem at any age would not know where to go for support.